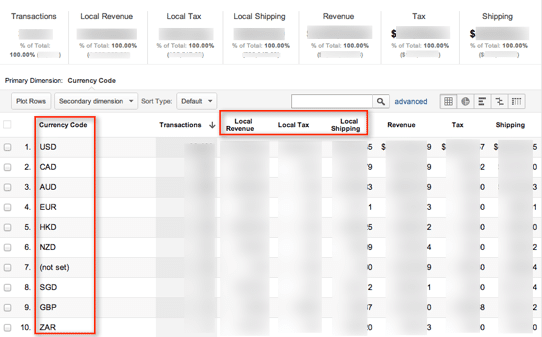 Multi-currency ecommerce tracking support in Google Analytics (GA) has finally arrived! If your website supports multiple currencies during checkout and that data is going into a single Google Analytics profile, then you likely are aware of how important this feature is. Through a simple code change (discussed below), you can now indicate the currency code of what you are sending and Google Analytics will use the daily exchange rate from the prior day to convert the currency to the master currency you’ve defined in the profile settings. At Blast Analytics & Marketing, we’ve had early access to this feature. Prior to this feature, our client AllPosters.com was sending ecommerce transactions into Google Analytics as various types of currencies. Their profile was set for USD, but transactions were recorded in Japanese Yen (JPY), South African Rand (ZAR), and others that have high (or low) conversion rates that throw off the revenue metrics. To take advantage of this new feature, they added a single line of code to their receipt page. As soon as this was in place, Google immediately began using a daily exchange rate to convert the revenue numbers to USD (the currency selected for their main profile). The revenue metrics that were previously unreliable suddenly became useful and allowed the client to set the stage for proper ROI analysis and revenue performance analysis. Your ecommerce site supports multiple currencies and when you get to the receipt page to send your ecommerce data to Google Analytics, you are unable to convert the currency to your local currency (let’s assume USD for this post, but note that it could be any currency that Google Analytics supports). Let’s say that someone uses the Japanese Yen for their purchase. The total, in JPY (Yen) is ¥21022.54 JPY. This is approximately $250.00 USD. The impact is that if you have some transactions sending data as USD and then others as JPY (and other currencies on top of this), the previously reported Revenue metric in Google Analytics would produce highly inaccurate numbers. Note: If you are able to convert your currencies on your receipt page, then you don’t have to use this feature. The advantage of this integration is that Google handles the conversion for you by using a daily exchange rate to calculate the conversion. As you can see, Google Analytics will report $22,123.64 as the revenue total for these 4 transactions even though the correct total should be $520.00 USD. Google Analytics is over-reporting revenue by $21,603.64. This same issue extends to other metrics in Google Analytics: tax, shipping, and product revenue. By leveraging the new multiple currency ecommerce tracking feature in Google Analytics, you can ensure that the reported revenue numbers are more accurate. I say more accurate because it might not match your internal revenues exactly since you may be doing post-transaction currency conversion on your end differently. Most importantly though, you’ve brought the revenue metric in line with where it should be and you’ll be reporting $520.00 instead of $22,123.64 (using the example above). Update the code on your receipt page to specify the currency code. This must be set above the _trackTrans. 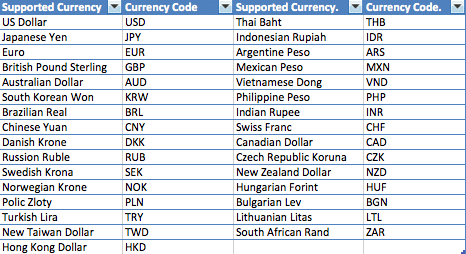 We’ve supplied a list of 31 valid currency codes below. If you attempt to use one outside of this, the ‘Currency Code’ dimension will show up as (not set). Going forward, Google will use the prior day’s currency exchange rate to convert the currency in your transaction to the currency selected in your profile settings. It is as simple as that. Your revenue metrics will start reflecting this conversion and you can begin relying on this data to make better business decisions. These four new metrics will be used to store the local values (prior to the currency conversion). Google Analytics’ new multi-currency feature increases sales metric accuracy for AllPosters.com. As an international brand, the AllPosters family of sites supports 20 currencies across 25 countries. Previously, manual adjustments were required before we could read sales metrics in Google Analytics when we had transactions with large currency conversion ratios to the US dollar, such as the Mexican Peso and Japanese Yen. The simple code update solves the issue by automatically converting all transactions to the primary currency on each site, providing sales metrics that allow us to make faster decisions with our web analytics data. Let us know if these tips helped you, or if you have any questions regarding the implementation of multiple currency shopping cart tracking. If desired, our team of expert Google Analytics consultants are always available to assist with this and other analytics strategy, implementation, optimization and training needs you may have. Do the standard solution available in Google Analytics to support multiple currency. ? As previously To solve this problem custom segments needed to create for each currency. @VirtualOffices:disqus Correct, this just launched on Wednesday and will be rolling out to all users over the next few weeks. 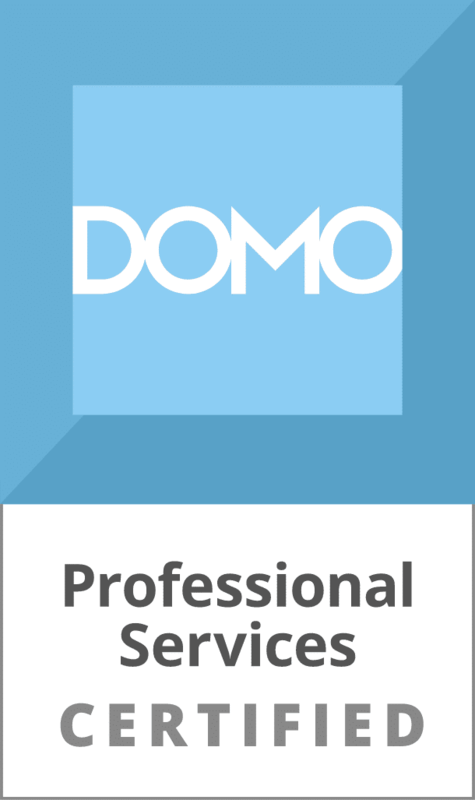 How do you get SGD (Singapore Dollar) reported in your sampled custom report in your profile? It seems it is not supported in currency code of Google Analytics. We have a Singapore site. “Google Analytics will convert them into the one currency based on your profile setting. This provides key benefits for e-commerce brands looking to conduct analysis across an international customer base and helps make some previously complex reporting easier,” google explained. Thanks a lot Joe, for taking interest to reply. and a Big thanks to google analytics for this feature. @google-2091c61ed45c22d83a8514f264c0ccbb:disqus Great question. For the client in this screenshot, we sent the data using SGD as the currency code and it ended up showing up in the report, despite it not being listed as a currency in the settings. So, it appears that GA does support a few currencies that are not listed in the currency dropdown. Before deciding on e-commerce solution and an obstacle to private cars, in the long term, you should consider several factors when making a decision. This new feature looks very promising and I have already implemented it to experiment with it. The custom currency report like the one mentioned above works fine except other queries with many standard and custom dimensions aren’t possible. None of the standard E-commerce dimensions can be combined together. For example I cannot segment transactions/products (catgeory & SKU) by currency code. Since Currency Code is collected as part of the e-Commerce transaction data why are all of the standard E-commerce dimensions not possible. Is there maybe something wrong with my implementation? apply a secondary dimension or create an advanced segment). It is good feedback and I’ll submit it to the Google Analytics team. Master ecommerce currency in the profile settings is USD. I am seeing very high unrealistic data in my GA reports, is there any chance that this issue is linked to multiple currency? Please suggest, how i can debug this. Do you know what is the currency code for bitcoin at google analytics? It should be XBT as per ISO, but I can’t find any official info on this. @mautematico:disqus Google Analytics does not support ALL currencies. Bitcoin, to my knowledge is not supported at this time as would be the case with all other cryptocurrencies. Thank you for the solution above. It works like charm. How can I convert the unsupported currencies before passing the values to GA? Olaf is the Director of Implementation at Blast Analytics & Marketing. He and the implementation team, handle configuration, installation and training of analytics tools. He spends the majority of time developing tracking code and He loves the challenges that every project presents and is always finding more efficient ways for our clients to collect, read and analyze their data. His passion is developing tools, processes or methods to make everyone's life easier. Add Olaf to your circles on Google+ Olaf Calderon has written 7 posts on the Web Analytics Blog.